*All advertised Europe fares are based off a return trip to Milan. Fares to other European cities may vary. London, Paris or *Europe: Brussels, Copenhagen, Frankfurt, Milan, Munich, Rome, Stockholm, Zurich and Oslo. Child and infant discounts may vary, please ask your specialist for details. Ticketing must be completed at least 7 days prior to departure and 7 Days after reservation whichever is sooner. Change and cancellation fees apply, please ask your specialist for details. THAI Airway’s network stretches from the heart of Asia across the globe to include major European cities, over 40 destinations throughout Asia and the Middle East, five in Australia/New Zealand, Los Angeles in the USA and Johannesburg in South Africa. Throughout a dynamic period of growth, THAI has maintained its commitment to excellence in customer service as a full service carrier with an exceptional crew to passenger ratio of 1:6. THAI has received many awards from both customers and the travel industry. Their cabins are meticulously designed using traditional Thai motifs with a contemporary interior. 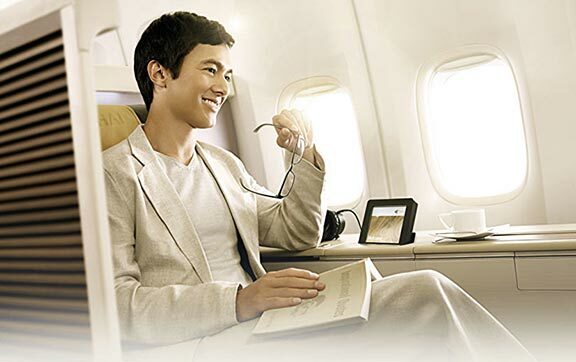 A diverse range of elegant cabins and seats are available on various routes and aircraft for your journey. The finest of THAI service, while in absolute comfort, and an impeccable service. Innovative, gourmet, culinary delights along with luxurious amenities, in-flight lounge areas and even changing rooms to allow you to freshen up and slip into something more comfortable. Fly in First class privacy on THAI's Airbus A380s and the newly remodelled Boeing 747s. Both of which provide specious 8 feet long semi-private suites. Our Boeing 747s are equipped with seats with a width of 23 inches and the Airbus A380s with a seat an expansive width of 27 inches. THAI invites you on a journey as smooth as silk in their elegant business class cabins that are inspired by the rich culture and heritage of Thailand. From the moment you step on board, every detail is taken care of. Recline in comfort in your reclining chair as our crew provide an impeccable service and take advantage of more than a thousand audio and video selections on demand while on your journey. Whatever your needs, you will be perfectly equipped to either ease off and relax or catch up on the world of business. 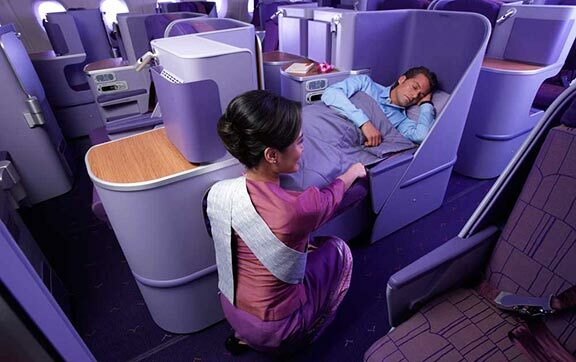 On THAI's Airbus A380s and newly modelled Boeing 777s and 787s, the chair can transform to 180-degree fully flat beds. Additionally, the spacious seats on all routes are customizable enabling you to select your optimum balance of head, back, leg angle and lumber support. Enjoy complimentary access to THAI's Airport Lounges when you fly First of Business Class. For information regarding Thai Airways airport lounge access please contact one of our Travel Specialists.